We have combined the wisdom of Eastern Body Movement with Functional Movement Screens (FMS) to evaluate and improve your ability to move without pain. Using functional movement screens we identify exactly where you have restrictions in your movements. Once the areas are identified we can work on restoring natural functional movement by using stretches and exercises tailored to you. Chinese principles of the breath, health and good posture guide us along the way. We can then teach you functional movements that you can practice at home or at work, alongside your regular treatment sessions of Tui Na or Acupuncture in the clinic. We were designed to move in many weird and wonderful ways! Eastern systems like Tai Chi and Qi Gong offer a large variety of movements, from simple to complex, from large to almost imperceptible, that start to do justice to our bodies’ amazing ability to move in so many different ways. Within the huge array of possibilities of moving, Eastern principles can also guide us as to what is a correct movement, ie a movement whereby our muscles and joints are used efficiently and with no possibility of damage, in either the short or long run. Eastern systems of movement look at how our bodies are designed to move in real life. Our musculo-skeletal structures are complex and incredibly subtle, so we can perform an infinite variety of movements. Our muscles work in groups to stabilize and move our joints, increasing and nuancing each others’ effects. They are affected by the slightest variations in muscle tension and joint positioning. The weight-bearing joints especially (hips, knees and ankles), must be aligned correctly to protect our body from damage over time. Once they are, there is no limit as to how much our legs can be used. In China, as in many traditional societies, people enjoy a rest by crouching – a position most Westerners cannot even get into. Can you get in this position? Try it – just try and keep your heels on the floor! Their bodies are not different from ours, they are just used to moving their body in that way. Once we understand how crouching works on the hips and lower back, on the alignment of the spine and therefore on the functioning of our organs, we can start to appreciate what a difference this makes to people’s health. The ability to move the spine fluidly and without pain or discomfort is vital! This ability comes from how strong and how flexible our muscles are as it is the muscles that move the body, and ensure that it is aligned correctly. What is often dismissed as “bad posture” here in the West is actually seen as a serious health problem in other societies, potentially creating many health issues (including conditions other than musculo-skeletal pain) further along the line. 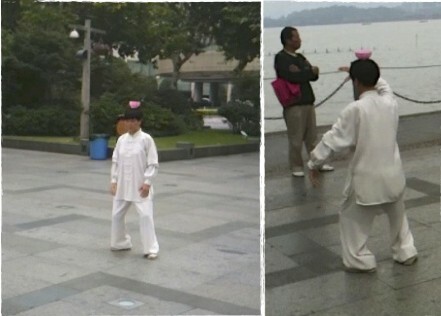 This lady is practicing tai chi whilst balancing a tea cup full of water on her head. She has excellent control and disassociation of her body – ie, she can move one part independently from another without accumulating tension…a skill that would benefit us all! Squatting, crouching and bending are Fundamental Human Movements... essential for health!